MmmmMmmm. See that up there.... THAT is the NEW Activia Selects Parfait. Delicious yogurt with granola on top to swirl in for your delight. 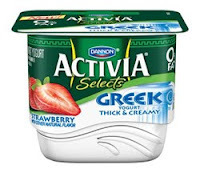 I received a coupon to try one of the new Activia Selects, and I chose the Activia Selects Parfait in vanilla. It was fabulous. I love the crunch that the granola added, and it tasted more like a treat than a snack... and it was so much better for me! If you don't know already, Activia is a very nutritious snack. Also, Activia helps regulate the digestive system with a probiotic culture called Bifidus Regularis, when consumed daily for 2 weeks. Activia is also participating in Every Cup Counts. Each specially marked package of Dannon yogurt contains an under-the-lid code. Each lid code that you enter by December 31, 2011 at www.cupsofhope.com will raise at least 10 cents for the National Breast Cancer Foundation (up to $1.5 Million). NBCF is committed to spreading knowledge and fostering hope in the fight against breast cancer. With support from Dannon, NBCF will fund free mammograms for women who could otherwise not afford them and will support research programs in leading facilities across the country. Activia Selects and Oikos single serve will include an additional donation of 10 cents, totaling 20 cents! So, not only do you get to snack on a delicious, nutritious snack...but you can help raise money for the NBCF! I personally cannot wait until I see the Greek Selects in my local grocery store! I LOVE thick yogurt... and the pomegranate berry flavor sounds delish! I wrote this review while participating in a campaign by Mom Central Consulting on behalf of Dannon Activia Selects Yogurt Series and received a coupon to facilitate my review and a promotional item to thank me for taking the time to participate. However, my opinions are entirely my own and I have not been paid to publish positive comments.